Large format is expensive. Large format is slow. Large format is unforgiving. However I've always loved the slow and meditative process. I've been a long time film user and recently started using film again. My last attempt (circa 2005) to do large format work was a mixed bag and ended on a sour note (no pun) as I tumbled down a cascade. And so did my camera and lens on a tripod which I tried to hold on to in panic. It took about 12 years to recover and start large format photography again. This is an attempt to write about the thought process, technical aspects and lessons learned eventually. 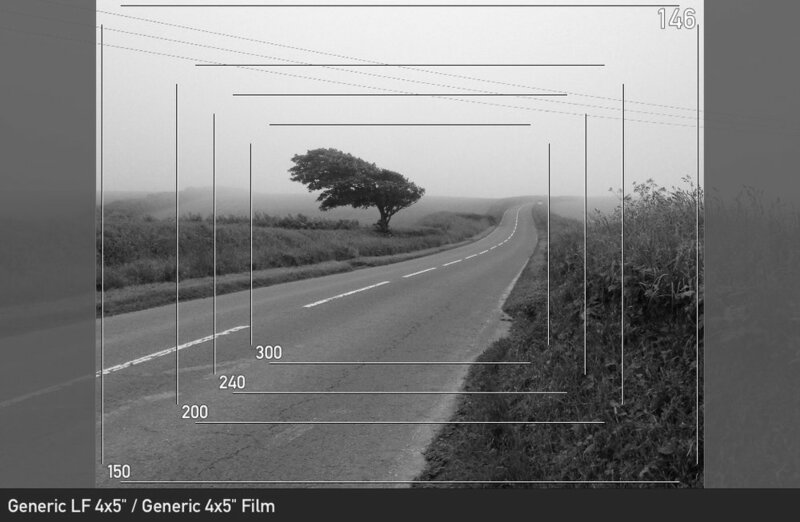 My approach and composition choice at the location for large format. I decided to go with Nikkor M 300mm . Click to view large. Chamonix 45N2 with Nikkor M 300mm/f9. Ilford fp5+ exposed at ISO100. Tree leaves at Zone 3 and developed for 6min in Ilfosol at 21C. Click to view large. Sony A7ii with Canon FD 35 Tilt & Shift lens. Exposure - f11+0.6s. Click to view large. Our week long trip to north Cornwall was a family holiday, mostly enjoying the ocean / coastal area with loads of Cornish Pasty and cream tea. Most of the images I made were for family album and ended up using GoPro Session the most. However this particular tree caught my attention on day one itself. Like most coastal regions, wind and other elements have a profound effect of the enviornment. The weather was mostly sunny so the composition would not have worked. Whenever we drove past this tree I knew it would make a cool image in foggy conditions. It simplifies the scene to make it a very strong composition. As luck would have it on our very last day here fog rolled in the evening which was just what I was hoping for. After dinner I drove to this place and parked in the lay-by and also set up my camera. I used both Chamonix 45N-ii and Sony A7ii. I prefer single exposure to work with so knew I will need to use tilt and shift lens on digital camera; ended up with Canon FD 35 TS-E. On my LF I used my Nikkor M 300mm lens (equivalent of roughly 100mm). This was the first image I made during the whole trip and as is often the case the excitement got better of me. I have an image made using Sony A7ii however the large format image, if I had properly executed, would have been a much stronger composition. So here are the lessons I learnt. I used rear/back tilt to get everything in focus and also to make the road look wider than it is without losing the prominence of the main subject. The image is quite sharp. For some reason the fog managed to enter through my ears and I put the tree at the right top third rather than the original plan of left side top third intersection. Also while loading the film in my jobo the best exposed frame was touching the the emulsion side of the slightly under exposed negative of the same scene. It left some marks on the film. Overall I enjoyed the experience of shooting large format or in fact any image after a break of over 6 months. I clearly was rusty and perhaps a bit rushed. Nikkor M 300mm /f9 is an excellent long lens. Small, light and sharp. However at about 10pm when light is fading it can be a challenge to focus. The ground glass of my Chamonix 45Nii is quite bright but still.